Are you planning to implement push notifications in your mobile marketing strategy? Or perhaps you’re a little further on in your push notification journey and are looking for some top tips and best practices? Either way, you’ve come to the right place – The Beginner’s Guide to Push Notifications is a comprehensive guide to help you get started with your mobile marketing strategy. Chapter 14. Measuring Success of Push Notification Campaign. 1. WHAT ARE PUSH NOTIFICATIONS? Push notifications appear as an alert on a user’s device when they are not using an app. After downloading an app the user is asked to give permission to receive future notifications. Push notifications are the building blocks of any great mobile marketing strategy as they are a direct line of communication between app owners and their audience. Each week, thousands of new apps are released into the app-mosphere. Getting your app found in the app stores can be difficult, but the struggle to keep your app on a user’s device is a bigger challenge. A combination of the right types of notifications can resolve this problem by keeping your users constantly engaged. It appears on the lock screen of a user’s device when it is not in use, or slides down from the top when the device is being used. When the user taps or swipes the notification, they are taken directly to the app. iOS 8 introduced the ability to add action buttons to pushes. This style of notification can increase your response rates as it gives users the option to take immediate action from the lock screen. In-app notifications are used to prompt a user to take a particular action when they are inside the app or the next time the app is opened. They are a great way of prompting your users to complete an action, such as checking out items that are sitting in their basket. When used correctly, Push Notifications are a great way of staying connected with your audience through all stages of the customer journey. Watch this video to learn about the top seven tips for sending effective push notifications. Push Notifications provide real-time relevant information for your users. They’re fast and interactive. You can engage people as they walk by your business. On average, we see a 30% push notification open rate from one of our clients in the retail sector. When they’re contextual and used in conjunction with location marketing, we’ve seen as much as a 90% open rate when used with iBeacons. When bringing in data from external sources, companies can inject personalization variables into push notifications and associated campaigns using CRM data. ‘Hi , Let’s work out! You thought this was the perfect time a while back, remember? When notifications are received in context to the users current surroundings a mobile moment is staged. These moments or experiences increase both the open and conversion rates due to the timely and relevant nature of the communication. Deep links are useful because they allow you to bring users directly to the content in your app that is most relevant to them. According to Techcrunch, users who download an app from a deep link are often twice as likely to sign up for your app and also twice as likely to still be an active user after 3 days. Segmentation is about making sense of your customer data so that the right content is sent to the right users at just the right time. For example, an Airline App notifies its passengers if their flight will be delayed. To Notify these users, the airline segment their audience into a group of users who are travelling on that particular flight so that they can notify them of the delay in advance. 5. WHAT ARE THE BENEFITS OF USER SEGMENTATION? When app behavior is combined with CRM attributes, Push Notifications become highly personalized and relevant for users. Setup Customer lifecycle segments to engage app users from the moment they download your app and throughout the customer lifecycle. Improve the customer experience by using granular segmentation to help tailor your campaigns. Listed below are segment examples that you can use to keep your app users engaged throughout each stage of the customer lifecycle. App users that were once engaged with your app but no longer interact with it are considered lapsed users. To prevent this, highlight the benefits of the app and add value to win them back. For example, highlight a new feature that is available within the app. Actively engaged users are referred to as power users. They should be nurtured at every stage of the customer lifecycle as they are your brand advocates. For example, give your power users recognition. Send them a notification thanking them for their loyalty and offer them 100 loyalty points on their card. The first time a user opens an app is a prime opportunity to set the tone for all future communication. A great notification idea for this segment is to to offer first-time users a discount to bring them back into the app at a later date. Send personalized notifications to shoppers who have abandoned their cart. Incentivize them to complete the sale by offering free shipping if they purchase within the next hour. Add location to the mix using virtual perimeters called geofences. Geofences monitor for app users when they enter or leave these virtual zone. Combine geofencing data with personal data such as interests and behaviors to create smarter segmentation, creating tailored experiences for every user. Customer lifecycle marketing empowers marketing teams to work more effectively by using campaign automation. Campaigns are set up to send when certain actions are completed within the app or pre-defined locations are visited. Creating segments of users who, for example, just signed up to the app or haven’t been active in the app in more than one week are a great way of continuously engaging your audience throughout the different stages of the customer lifecycle. When you event tag user actions in your app you start to learn more about each users interests and patterns begin to emerge. Event tags can also be used to prevent app churn. Each stage of the customer journey is assigned a custom tag allowing you to visually see where users start to drop-of. 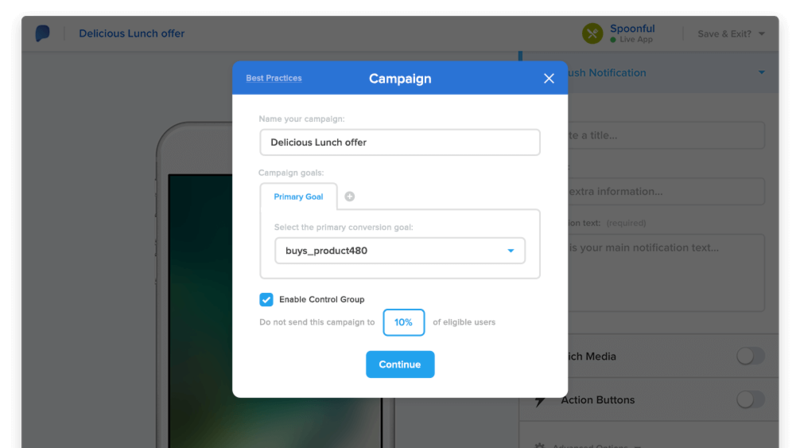 Here are some examples of automated campaigns that you could send based on user behavior and in-app actions. Based on Michael’s previous saved jobs and job search history, JobUp can send personalized tailored notifications when new jobs are listed. For message center campaigns, the card appears the next time the message center is opened by the user. This type of silent notification is great for non urgent messages. Sarah is booking a flight to New York with MoAir. Before she enters her payment details, Sarah receives a well timed in-app notification offering her 15% off a 20kg bag to check-in. 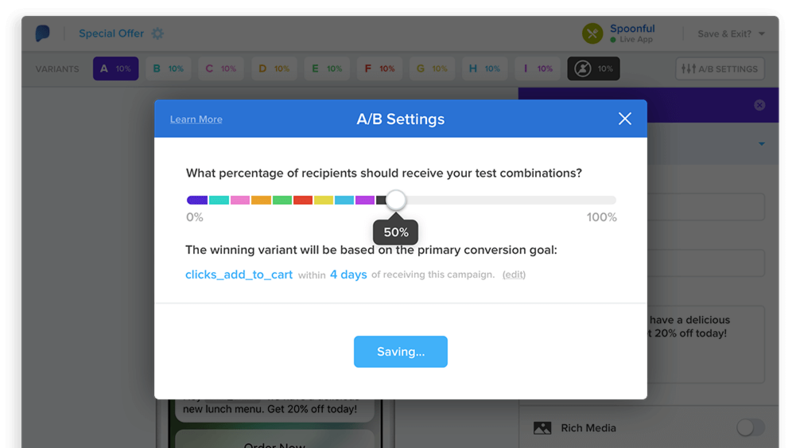 Multivariate testing invites marketers to test a number of different variants of their campaign simultaneously with the option to automatically choose the most effective variant for future campaigns. Have you ever sent a campaign to a segment of users, noticed an increase in user activity or transactions and thought to yourself, I wonder if that would have happened anyway without the campaign ever being sent? Luckily, control groups allow you to find out. By eliminating a small group of users (e.g. 10%) from receiving the campaign, you can compare the attribution rate of the campaign between the control group and the larger group of users who received the campaign. The video below highlights the important features you should include in every notification you send. The Pulsate message center gives your notifications a destination. This means that app users can easily find, retrieve and reply to notifications. The Message Center seamlessly fits with your brand. Have real-time two way conversations with customers in your app. Wow your users with images, gifs or videos embedded into messages. Add one-click payments to grow, engage and monetize your app with the Pulsate Wallet. Send content that is both personal and relevant to your users. One click setup of surveys to find out how you’re doing. A large luxury department store was looking to leverage proximity marketing to increase engagement rates through their mobile channel and improve the overall in-store experience for their customers. To achieve these goals they used granular segmentation, contextual triggers and intelligent campaign delivery provided by the Pulsate mobile marketing solution. Sunglasses from Ray Ban’s new collection were exclusively available in the department store and were being offered at a special price of two for €230. They wanted to target app users who had previously purchased from this brand so they created a campaign to be sent to this segment of users when they triggered a geofence around the store. If a user entered the store within 30 minutes of receiving the campaign, they received a follow-up campaign that was triggered by a beacon offering them 100 extra loyalty points if they purchased from the sunglasses that day. 11. HOW OFTEN SHOULD I SEND PUSH NOTIFICATIONS? There is no one size fits all answer and the guidelines are different for each industry. For example, if you have a news app, you may be able to send more push notifications without annoying your audience. On the flip side, if you have an app that sits within the retail space, your audience probably won’t appreciate receiving multiple notifications every day. Therefore, you need to test and measure a number of different elements before deciding on a frequency that works well for your app. Ask yourself, ‘Is this message in line with this user’s interests?’ before you send it. Have you segmented your audience so that only those interested, receive it? The time you send out your notifications is key. If your app is available in multiple timezones, make sure you adjust the time for each. Closely monitor your analytics to make sure your notifications are not causing fatigue amongst your customers, resulting in them deleting your app. Notifications appear in a few different formats depending on whether the user is actively using their device at that moment. On iOS, app users can turn the noti cation sounds on or o at an individual app level, they can choose to display a red badge showing the number of unread notifications and they can also pick how the noti cation appears. The Apple Watch lets you receive notifications conveniently on your wrist. The moment a notification comes through, you can see an overview of the content at a glance. iOS 10 brings with it a host of new updates that bring notifications to life. Listed below are four of the new key features that will impact how app owners engage with their users in the near future, and how the experience for app users will improve. In iOS 10 you’ll be able to quick view pending notifications and replace them with the latest notifications with updated information. This feature is very useful for apps that provide time sensitive information, such as breaking news, the latest odds for betting apps or up-to-the-minute score results. iOS app owners will have the ability to create push notifications that support rich media such as images, GIFs, videos and audio that app users can view directly from their lock screen. 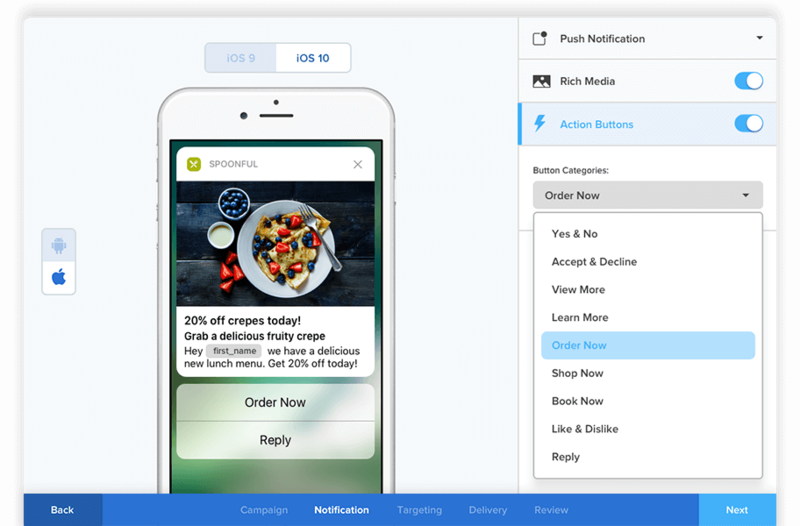 The iOS 10 release invites brands to send push notifications that include rich visual content to immediately catch users attention. Embed GIFs into cards that help bring your message center to life. Include videos in your notifications to highlight how to use a product, view match replays or lots more. Enhance marketing campaigns with audio directly from the notification. Users have to take action in order to experience the audio, this way it is will not start playing for them without warning. When a notification appears on the lock screen, app users can engage through interactive 3D touch or by swiping to the left to reveal further options such as view, clear, snooze and many other options. Android Wear smart watches show push notifications as they appear and allow users to reply directly from the watch. On Android, push notifications appear in two main visual styles – Normal view and big view. The look and feel of Android notifications are significantly different than previous versions. Android Nougat (N) displays notifications that avail of the full-width design with smaller icons, making better use of space overall. Functionally, the user experience is better as notifications expand twice to reveal more information and to take action directly from them. App users can control how they’ll receive alerts for various apps. The end user can choose to make push notifications they receive silent, or choose to block them from that app completely. This means that app marketers need to carefully consider the content of notifications they are sending to each user. 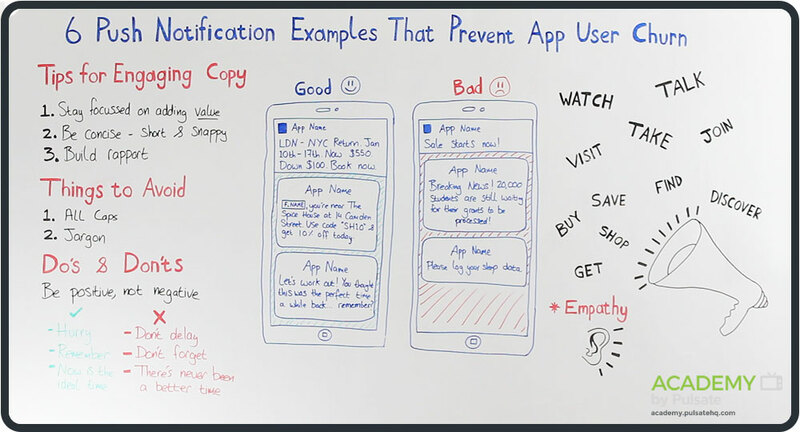 Making notifications hyper personalized, relevant and time sensitive is important for app retention, as the end user is now just two taps away from opting out completely. How you ask app users for permission to send them push notifications is crucial. You only get the opportunity to ask once so it is important that you carefully consider the approach you take to maximize permission opt-ins. Up until the arrival of Android 6, there was a clear difference between how iOS and Android asked their app users for permissions. For Android, a user couldn’t download an app without giving permission. On iOS, the approach has always been to ask users to grant permission after they download an app. Android 6 introduced a run-time permissions model which is similar to the iOS approach and allows app developers to control when they ask their users for permission. It is only possible to trigger Apple’s default permission once per feature. Prime your users to accept requests before the default iOS permission request screen is displayed. Below is a list of metrics that should be followed to measure the effectiveness of the push and in-app notifications you are sending. The user retention rate is the number of app users you keep in comparison to the number you had when starting out. To calculate this, take the number of customers at the start of one point (S), the number at the end of the period you’re measuring (E) and the number of new customers in-between those two points (N) to get the percentage. Similar to the way you would measure the revenue attribution from email marketing campaigns, it’s vitally important to measure the revenue attribution from your mobile marketing campaigns. Building an app and getting an audience to download it is only the first part of the customer lifecycle. 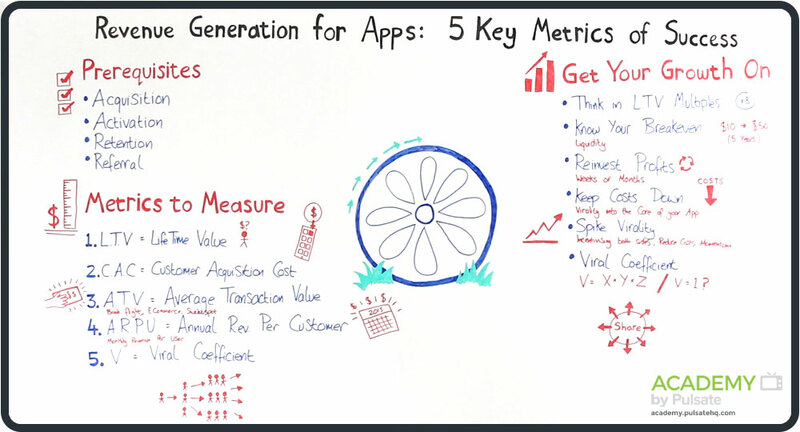 To bring it a full 360°, a number of other metrics should be measured such as LTV (Lifetime Value), goals, conversions and revenue attribution.